It's hard to believe it's been six months since I last posted! Life seems to have this way of speeding up and before I know it, it's JULY! Wait... What?!? We have been going along and doing our thing just like always. 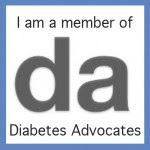 Diabetes is a part of our lives. But it's not the main part anymore. Instead of being in the front seat like it was when she was first diagnosed, it's now kind of pushed into the trunk. Except when it rears it's ugly little head. And makes me wonder if it's really been living in the trunk or if, for some of us, it's been riding in the front seat a lot more than I realized. Avery has always been pretty cool with diabetes. She was so young when she was diagnosed that she doesn't remember life before. Testing and site changes, and counting carbs has always been a part of her life. It's just the way it is. No big deal. She's never minded wearing a pouch with her Dexcom - or now her phone - around her waist. She's never complained about visiting the nurse's office. She's never worried about what her classmates think. I never thought she even viewed herself as different. We also started having her use her phone more to text her Dad (he handles the daily D care at school since I can't exactly tell a class of Kinders to hold on a minute while I answer a call!) with her number. The Dexcom Share is amazing for this. 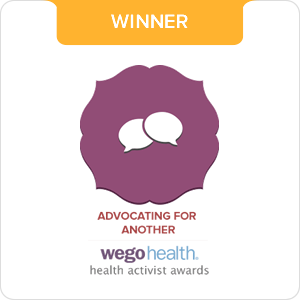 It lets both of us see what she is and how she's trending so it really lets us make treatment decisions together rather than having to always involve the nurse. We had a new school nurse this year and SHE WAS AMAZING. Seriously, I don't know how we've gotten so lucky! She's a gem and she really learned quickly about T1 and how to handle it. She wasn't just taking care of Avery - - - She had TWO other T1's and a school of about 1,200 kids! I'm so grateful to her - she did such a great job! Anyway, we are working toward more independence and self care. 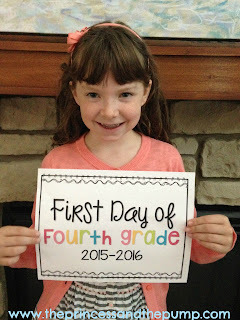 Hard to believe, next year will be Avery's last year in her elementary school. At Christmas, this sign was on her list. I had to get it for her. I thought it was awesome and a little sad at the same time. She's never liked when random people would ask her about the "thing on your arm". But recently, it's gotten worse. Avery wears her Dexcom sensor on her arm. Her back (upper bottom but she hates it when I say that) is reserved for her pods. She is still super thin and muscular. The endo has not recommended her belly or her legs be used for sites. Plus, we get great readings and wear out of arm sites. The only downside is that you can see it. She loves the pod because it's hidden. Dex is right out there when she's wearing sleeveless or short sleeve stuff. School hasn't been an issue. She says they all know what it is and don't ask about it. The pool is a different story. We have always had great luck using the Opsite Flexifix tape around the sensor. (Click that link to see what we buy and where. I don't get anything from it if you buy or it or anything. This is just what we use!) We can get a good two weeks out of it. If she's swimming a lot, it starts to come off. And here's the dilemma. She doesn't want to wear it anywhere but her arm. She doesn't like it just there on her arm because people see it and ask her about it. She doesn't want to use any of those decorative tape things to help hold it down because it draws attention. She doesn't want to wrap it or wear a sleeve because it draws attention. We have finally decided that for the pool we will wrap it. My awesome Diabuddy, Lora, came to our rescue on vacation when I ran out of Opsite. 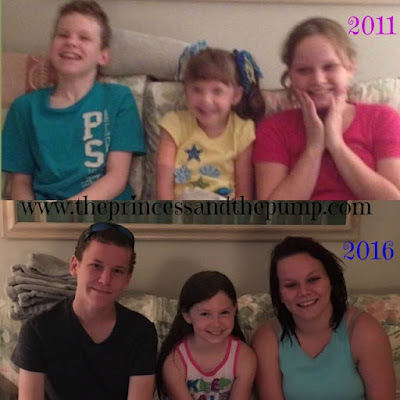 Avery and Lora's Kiddos in 2011 and now! They are all growing up waaayyy too fast! Stop! She let us borrow a roll of CoBand tape. It did well holding Dex on while she swam. Although it's hot pink and doesn't exactly blend in, she would rather people think that she's injured or something than ask about the sensor. We've worked really hard to teach her empathy. We've talked about how everyone has their "thing". No one's life is perfect. She has diabetes. Other kids have ADHD or have to split time between parents that fight all the time or have speech problems or a million other things. She gets that. She's 10. She's becoming a young lady. She's more concerned with appearance and friends now. Her social circle is expanding. That's hard for any kid. But when you add a disease that means that you might look a little different and have to do different things than your peers when your number one priority is figuring out where you fit in... That's even more complicated to navigate. I'm not surprised that we are dealing with these issues. I knew it would happen eventually. It's just happening sooner than I thought! I feel like she was just that little girl with her pacifier and her pump! All we can do is keep moving forward and addressing each "issue" as it arises. Lord knows, I can't take it away from her no matter how much I might want to at times. All I can do is help her through it. Give her choices. Let her have a say. Keep telling her she's awesome. And being there for her when she needs me. 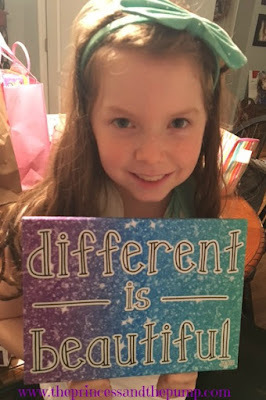 She's hung her "Different is Beautiful" sign in her bedroom right by her door. I see it every time I leave her room. And every time, it tugs at my heart. It makes me proud. It makes me sad. I hope you have all had a wonderful holiday! We have a had a lovely day and Christmas Eve! Diabetes, however, was not quite so lovely! I was up until about 4 am waiting on low blood sugars to rise. Ugh! However, I used my time to write my own version of "The Night Before Christmas"! I hope you enjoy it! And from our family to yours, Merry Christmas! 'Twas the night before Christmas when all through the house, not a creature was stirring - not even a mouse. The stocking were hung by the chimney with care in hopes that St. Nicholas soon would be there. When from our daughter's room there arose such a clatter, I sprang from my bed to see what was the matter. Away to her room I flew in a flash, threw open her door, tripped on something she hadn't put away and made a loud crash! Her Dexcom shone with a very bright glow - giving luster of midday to test strips lying below. When what to my wondering eyes should appear but a number so low it filled me with fear. More rapid than eagles her supplies how they came. I whistled and shouted and called them by name. "Now meter, Now test strips, now lancet and wipes! On smarties, On juice boxes, On pudding and tabs of all types!" To the front of her lips - not a bit we let fall! Now eat away, drink away, eat away all! Then back to the kitchen I hurriedly flew for more armfuls of juice boxes and glucose tabs, too! And then I did hear as I rushed back to her room, four little beeps! The under 55 beeps of doom! I drew in my head and was turning around. Her Dad, down the hallway, he came with a bound. She was under the covers from bottom to top. Her pillowcase was tarnished with random blood drops. Her hands were well hidden behind her small back. Testing blood sugar that way would require quite a knack. Her eyes were still closed. She looked sweet and merry. Until with a sip of juice she muttered, "I like APPLE. NOT CHERRY." She was still asleep but fussing. A right grumpy little elf. I laughed as I saw her in spite of myself. But a fluttering of eyes and a turn of her head soon gave me to know I had nothing to dread. She spoke not a word but went straight to her work. Drinking and chewing. Then sitting up with a jerk. Her fingers she held in front of my nose. A quick test reveled that her bg had rose! 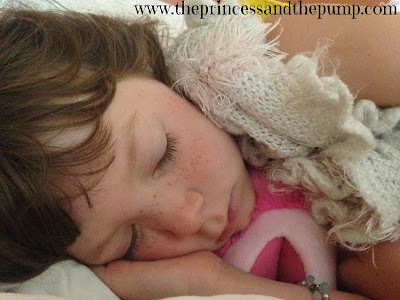 She pulled her covers back close now that she was out of danger. Looking again like a sleeping little angel. But I heard her whisper as we walked out of her sight, "Thanks for taking care of me, Mom and Dad. I love you. Good Night!" Isn't that the truth? Sometimes it's happy and joyful laughter. Sometimes it's more maniacal. But at least we're laughing! We've doing a lot of laughing since I posted last! I'll let you decide what kind of laughter it's been! 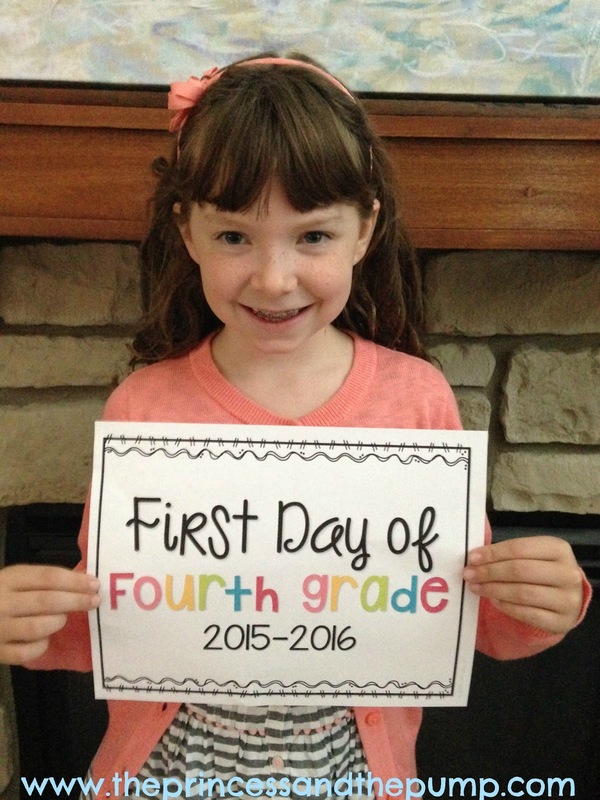 At the start of the school year, Avery got a new school nurse. Surprisingly, I wasn't as uptight about this as I would have guessed. 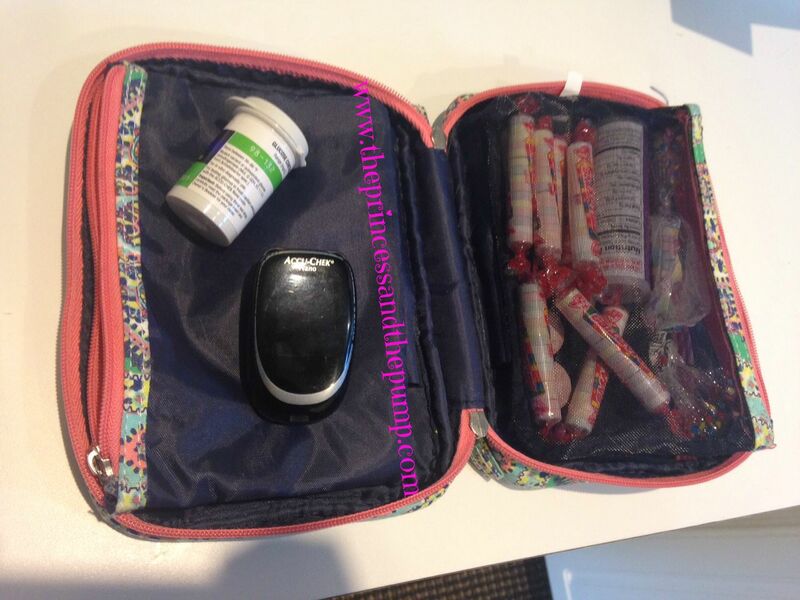 Just her being older and more knowledgeable about her diabetes helped put me at ease. A little. But the unknown is always a little scary. Her wonderful angel of a school nurse for the past few years knew she was leaving and put together a big binder of how to's and even trained the incoming nurse at the end of last school year. Then a few days before school started, that nurse quit. So here we were about three days before school started with no nurse. Cue freak out and maniacal laughter. They hired a new nurse and I made an appointment to go in and talk to her the day before school started. The three of us walk into the clinic with all of her supplies and orders and such... and who do we see? Not just her NEW nurse but her OLD nurse! Cue the tears! Her wonderful, incredible nurse had come all the way back to spend the first few days at school making sure that "her girls" were taken care of and that things went smoothly. Avery said, "I think she knew I was going to be a little nervous without her so she came to make sure we were all ok!" What a blessing she is! We have also been blessed with a wonderful new nurse! 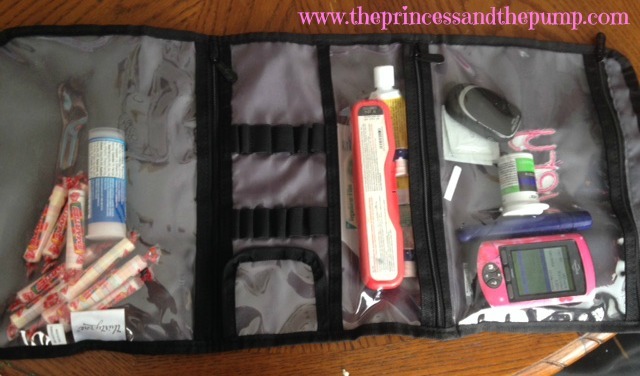 She has a BIG job and she's handling it and learning about diabetes and doing a great job! One of the other things that has been keeping us busy is cheerleading! I took on the role of the director of the basketball side of our peewee cheer program. I'm also currently coaching Avery's basketball cheer squad. That is keeping us quite busy! In the fall, Avery started practice with her competition cheer squad. She was thrilled to make the competition team after trying out in the spring. Competition cheer kind of took us by surprise and presented some new challenges. I did not coach her squad. So that meant that Avery was on her own at cheer practice. Originally I thought I might have sit in the car during practice but honestly, neither Jason nor I wanted to sit in the car for two hours twice a week. So... we let her have at it and try handling her care on her own! It was definitely A LOT of trial and error. 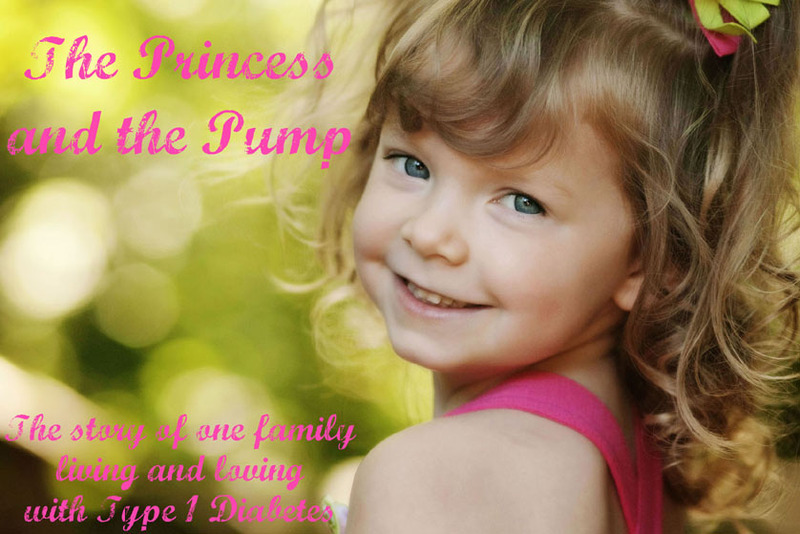 We knew that traditionally cheer and especially tumbling made her blood sugar drop like a rock. So we started out under blousing and doing minus basals. Only have her end up... high. What we didn't take into account was the nerves. Avery is a good cheerleader. She's used to being one of the girls who is able to do the routines well without much practice. She's used to having some of the highest jumps and cleanest motions. But on the competition squad... everyone else is good, too. And some of these girls were able to do more tumbling than she could. So... again, cue the tears! It was a great learning experience for her. And she totally stepped up to the challenge. She shook off those nerves and got after it. She practiced and practiced and practiced and now she's got an amazing toe touch and round off back handspring! I'm so proud of her effort and perseverance! She really handled the diabetes aspect well. Her coaches were awesome and kept and eye on her. But she handled things on her own. She would text or call us if she was low or high or didn't feel right. To our pleasant surprise, often she would text us what she THOUGHT she needed to do and she would be right on! The largest issue was AFTER practice. She practiced for two hours twice a week. As she got more confident in her tumbling, the more she did at practice. So TWO hours of tumbling and dancing and you can just imagine what that did to her blood sugar. Sometimes even into the next day. It was not at all uncommon for her to run low for an entire day after practice. The kicker is... we never did figure out a fool proof method for handling it. We would think we had an plan and we would try it and it would work. And then the next time it wouldn't. Cue more maniacal laughter. Or bad words. Or both. It got to the point where J and I would be talking about what to do and we'd say, "Well, whatever we THINK we should do - let's just do the opposite." But what are you going to do? She LOVES cheering. We would never keep her from it even though it resulted in many sleepless nights and great frustration for US. She just rolled with it. Just like she always does. The lows and highs never seemed to faze her much. She pushed through the tiredness and the headaches and just kept doing her thing. Did I mention that I was really proud of this girl?? We were a little worried about the competitions because she would be away from us and not really accessible for a period of time. 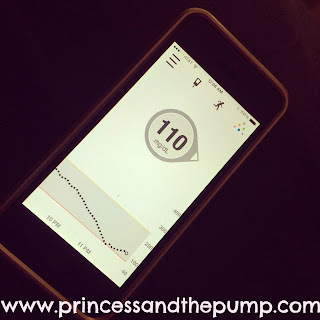 We had no idea what the nerves and excitement would do to her blood sugar or how to handle her care. We did not want her to wear her Dexcom receiver while performing so what we did was have her wear through the warm ups and then give it to one of her coaches right before she was to perform. If we noticed she needed to do something - we would text her. It really worked quite well. 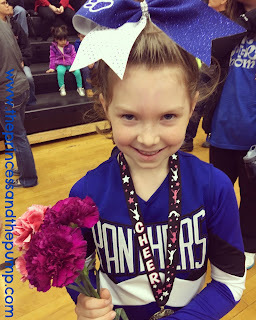 The nerves never affected her numbers on competition days and it all went really smoothly. Something else new for us this fall was getting RID of our Dexcom receiver when we upgraded to the G5 system. We now just use our iphones! Avery was thrilled to have one less thing to carry around with her during the day. She wears her phone in the pouch around her waist just like she always has. We love the share aspect because we can check in on her throughout the day and night. 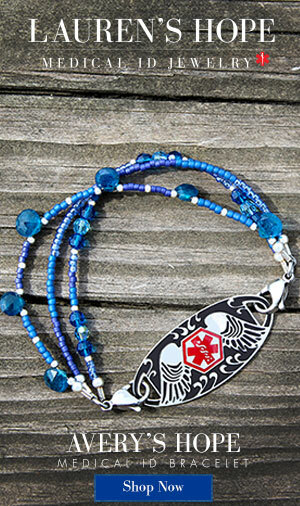 Our phones also alarm and alert us when her blood sugar is too high or too low or dropping quickly. This is what the app looks like on her phone. And here is an example of the ugly blood sugars we saw just so you know I'm keepin' it real and not lying! Y'all know my love for Dexcom and it just keeps growing! I didn't think I could love it any more but I do! We love just using the phones! I wasn't sure how that would play out and if it would work ok at school but it's been great. It works just like the receiver did. And she also can text us with questions and we can text her should we need to. It's been a nice help in transitioning her to caring for herself. All of the independence we have been able to give her this year at cheer practice and competitions and birthday parties and just in LIFE would not have been possible without our Dexcom keeping watch. I trust that little thing more than I've ever trusted any piece of technology before. I don't know if it would be so "easy" to let her try things on her own without knowing that Dex is keeping a watchful eye on my girl and we will be alerted if there is a problem. It's not just nice for US, either. Her teachers and nurse love it, too! They love knowing that it is keeping track of her. AND that we are able to see and keep tabs as well! My parents have also put the app on their phones so that they can have access to her numbers when she is with them. They don't set the alerts - her phone alerting is enough for them. But it gives them piece of mind! AND - they check on her from time to time when she's not with them, too! I'll get a text - "Is everything ok?" "Her numbers have been low... cheer?" It's nice to know that someone else is checking on our girl! I've also had my best friend put the app on her phone! She loves it, too! She said she loves being able to just look at her phone to see what Avery's number is and not have to bother her by asking! She likes to check it a lot when she's watching Avery - just to be sure she's ok! I really appreciate that! My love for the G5 is really another post entirely! But it's been a huge blessing and really helped us give her the independence that she is so craving! JDRF has also been keeping us busy - as usual! I don't think that I mentioned that I was honored as the Volunteer of the Year for our chapter at our Gala in May. I was totally blown away and shocked to receive this honor! We had a great time at the Gala and raised a lot of money for diabetes research! Gala selfie in the car! A is too busy reading to smile! We also put together our walk team, The brAVERY Bunch, to participate in our 7th walk! We were thrilled to raise around $15,000 this year! In all honesty, this was a tough walk year. After SEVEN years, people just aren't as willing or motivated to donate. Now, I know you may be thinking that I'm insane because we raised so much money... but last year we raised over $22,000! With all of our cheer responsibilities, I didn't have the time or energy to do as many fundraisers as I had in the past. We didn't have anyone walk with us this year. It was a cold, rainy day - and we just told the couple that were actually willing to come to stay home and keep dry! I get it... 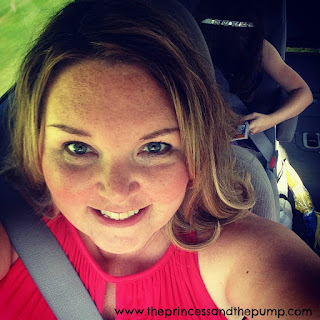 Many of our friends have kids and responsibilities that keep them very busy! It's not always possible to walk with us. And it's not always possible to raise a ton of money. But we just keep at it and we don't give up. We know that every bit helps. And we know this isn't a sprint - it's a marathon. There will be bumps in the road. We've just got to keep going. School, as always, is keeping us busy and laughing! At least for me, the laugh has a bit of crazy in it and makes my eyes twitch! 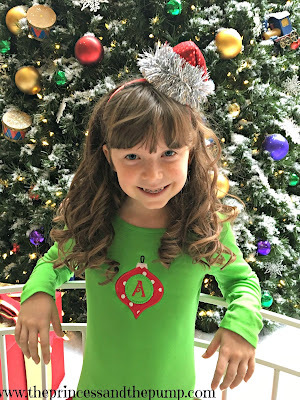 Avery is having a great year and has two incredible teachers who are teaching her so, so, so much and really bringing out her confidence and independence! I am also having a good year - although a very challenging one! I love, love, love my kiddos! I have 24 kinders in my class this year. When we have 26, we get an instructional assistant. I've had an IA for the past five years. Before that we shared other assistants. This year I'm totally on my own. In a way, I really like that! But it's been challenging because I'm used to being able to do things a certain way or do more, bigger, grander things because I have help. Sometimes I forget that and find myself swamped and overwhelmed! Our house has been another MAJOR cause of laughter - mostly the eye twitching, crazy kind! We started a rather large renovation in September. It will finally be totally finished TOMORROW! It's involved packing up every room in our house into boxes. And unpacking them all again. And sometimes repacking and re-unpacking again! It's involved living mainly in our bedroom for a week. And being without an upstairs bath (shower) for a week. It's involved so much dust I could build a snowman. It's involved having a refrigerator in our living room. And it's involved realizing that packing up our "necessities" involves a rather large box of diabetes supplies. We've been surprised at the change we've seen in Avery the past few months. She's wanting more independence. That's normal for any kid her age. But throwing diabetes into the mix adds another layer of concern. We've let her go unaccompanied to birthday parties and cheer parties and play dates. I can't say she always has handled diabetes "perfectly" - but she's learning and she's doing quite well! 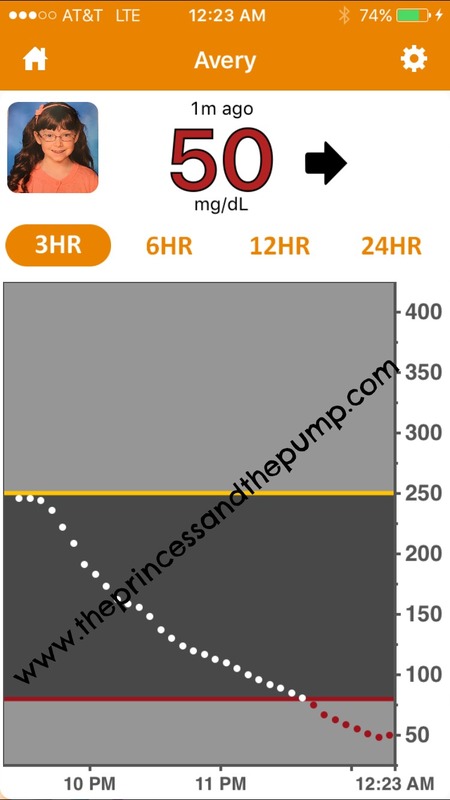 One day her nurse got on her at school for punching her carbs and insulin into her PDM and delivering so quickly that the nurse was not able to double check. I understand her concern. But we did have to realize that Avery made the correct decision. And that sometimes at home she just lets us handle it... but that doesn't mean she isn't paying attention. On her own and with other caregivers she knows her stuff. That's a proud and bittersweet moment of realization. 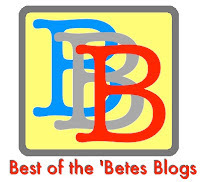 I miss blogging. I miss all of you. I love that I still get emails and talk to many of you on Facebook and Instagram! I hope to find the time to write more in the new year... I need it. It's good for my soul. And I'm always honored and surprised when it helps someone else, too! It's been four months filled with many, many things - but we're still laughing all the way! And I consider THAT a successful few months! 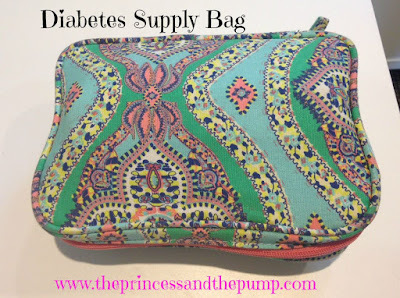 You know what's a really hot topic for people with diabetes and/or their parents??? Everyone is always interested in what kind of bag you are using! You may like what you have but you always wonder if there isn't something out there that's maybe just a little more... perfect. I love bags. I have a blue million of them. Just ask my husband! And that's because I am always searching for that perfect supply bag! This is probably my favorite. We had another one that we used until it was just too disgusting to use it any longer. It is a cosmetic bag from Target. I like that it's small enough for me to throw in my purse. But it's big enough to hold our essentials. It's got two zippered pouches in the middle. One is mesh and one isn't. We keep low supplies in one and a meter and strips in the other. There is one zippered pouch on the back inside side. That's where we keep the glucagon, lancets, etc. The other inside side has places for make up brushes. I took the thread out of one of those making it big enough to hold the Omnipod PDM. I left the other ones smaller for the lancing device. It would also work for insulin or an insulin pen. Another bag that we have used recently is a Timeless Beauty Bag from Thirty One. 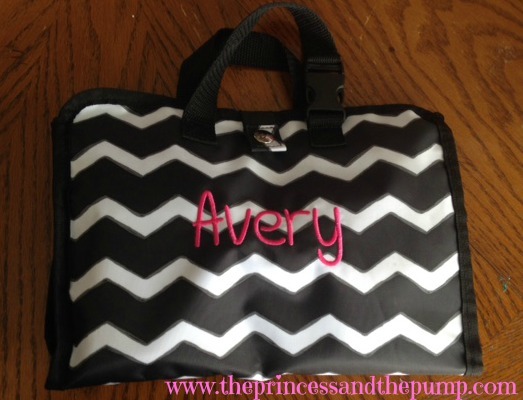 Avery liked this bag because we could put her name on it! 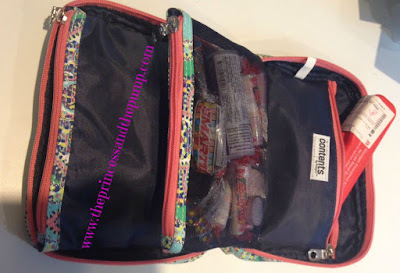 But we also liked it because it was a little flatter and could be smushed up to fit into her bookbag a little better. My mom likes this one best because it has handles that she uses to carry it! 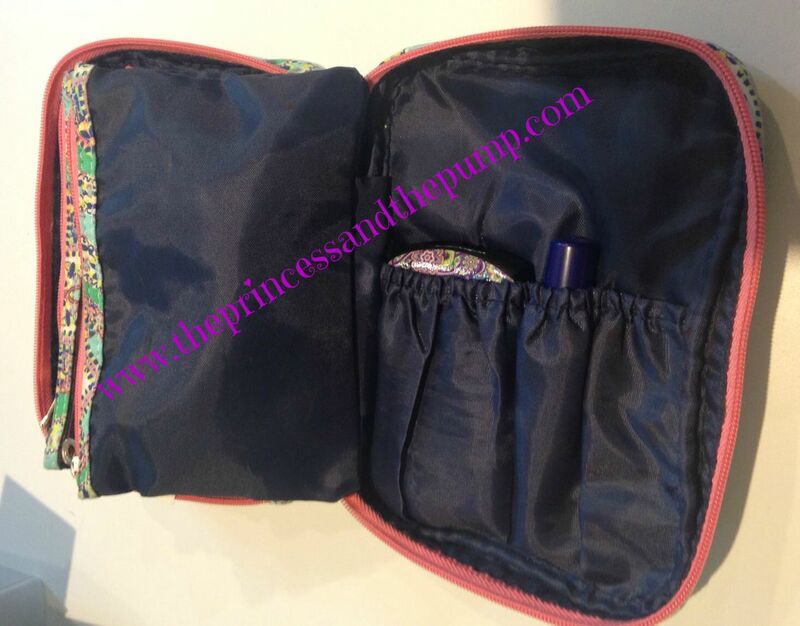 It has lots of zippered pouches inside! It's nice that they are clear and you can see in them! There are also elastic holders that you can for syringes, insulin, etc. There are some places that sell supply bags and they are super cute! I just have never found one that works well for us. I really love the cases from Sugar Medical. My only issue with those is that there isn't room for the glucagon and that's a deal breaker for me. I've got to have that gluc with us at all times. So, that's what we are using now! If I find something else I love, I'll let you know! What do YOU use! What do YOU love?! ?